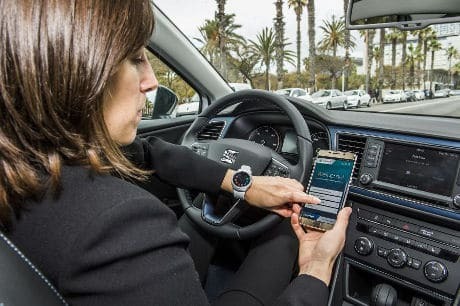 Car manufacturer Seat, Samsung Electronics and software giant SAP have created a technological alliance to develop connected car projects that could enable drivers to reserve car parking spaces and pay with a fingerprint using Samsung Pay. The companies are showing their ideas at Mobile World Congress this week. Alongside the parking concept, Seat and Samsung are also demonstrating digital keys using wearables and smartphones that would allow consumers to share keys with others through their smartphones. “In Q4 2015, SAP successfully launched SAP Vehicles Network (SVN) in the US and Europe with Samsung Pay as a launch partner, focusing vehicles-centric services such as connected parking and connected fueling,” Seat says. “Under this premise, Seat, Samsung and SAP have developed a future concept that can be accessed with the Seat ConnectApp. “The plan is for this app to enable users to reserve a parking space from any location through fingerprint recognition, navigates the driver to the location and automatically raise the access gate when the car approaches. When the driver exits the carpark, payment is planned to be made directly from the app without leaving the car. “Additionally on-hand at Mobile World Congress, Seat and Samsung are presenting an evolution of last year’s Digital Key proposal, which was a solution for locking and unlocking the doors, turning on the air conditioning and opening and closing the windows remotely, from a smartphone or wearable,” the company adds. “The innovative solution this year is a function that can be accessed in future in a Seat car, whereby authorisation can be given for another person to share the car without the need to transfer possession of a key, even if both people are in different locations. The function consists in issuing a completely secure authorisation to another person to share the car by transferring a virtual copy of the car’s digital key to the other person’s smartphone or mobile device for a duplicate key at your fingertips.